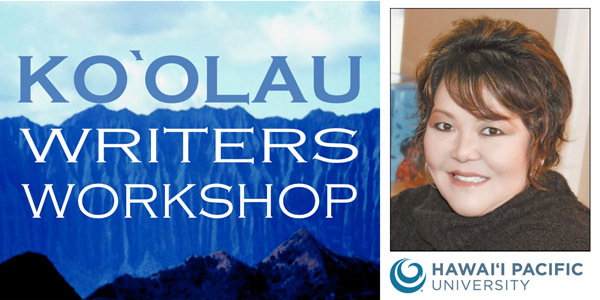 Tomorrow is the deadline to register for the 18th annual Koolau Writers Workshop, hosted at the Hawaii Loa Campus of Hawaii Pacific University in Kaneohe. If you’re a writer, or imagine yourself becoming one, it’s worth checking out. Writers’ events are surprisingly scarce in Hawaii. The well-known Maui Writers Conference (which relocated to Oahu and rebranded as the Hawaii Writers Conference) met an inauspicious end in 2010. An attempt to launch a successor, the Aloha Writers Conference, yielded only the “first annual” gathering in 2013. The Bamboo Ridge Writers Institute, in which I once participated, is now primarily a scholarship program. So the Koolau Writers Workshop is a rare gem, and fortunately, one that’s open to writers of all levels. This year’s keynote speaker is Lois-Ann Yamanaka. She’s a Molokai-born, prolific, award-winning published author who started as an English teacher, still teaches, and even founded the Naau Learning Center to teach writing as art. Lois-Ann Yamanaka was born in the Sixties, which makes her perhaps the first of Hawaii’s prominent Gen-X writers. Her stories are laden with allusions to the Sky Slide, Checkers and Pogo, and Tomoe Ame (when it was still good), the stuff of my own Hawaii childhood, and that by itself makes her interesting. What makes her great is the way she takes my Sky Slide memory and then finds the part of it that’s kind of a bruise, and then pushes down on it and pushes down on it until she’s tunneled her way into the part of me that’s still screaming all these years later. Her novel Blu’s Hanging is the finest piece of literature set in Hawaii or written by a Hawaii writer. And as much of a draw as Yamanaka is, Saturday’s workshop offers much more. According to the official schedule, the day will begin with a reading of “Crow” by Nicholas Beecher, Winner of the 2015 James Vaughan Poetry Contest. And wrapped around the midday keynote will be several focused sessions. Fiction writing will be covered by Shawna Yang Ryan. who teaches in the Creative Writing Program at the University of Hawaii at Manoa, and Chris McKinney, the author of five novels, a feature film screenplay and a short film. Independent filmmaker Lisette Marie Flanary will teach scriptwriting, and Susan Scott, a columnist with the Honolulu Star-Advertiser and the author of seven nature books, will teach creative nonfiction. Finally, the poetry sessions will be led by Susan M. Schultz, an author of several books and the founder of Tinfish Press., and Eric Paul Shaffer, published author and creative writing teacher at Honolulu Community College. In addition to HPU, the event is supported in part by the Hawaii Literary Arts Council through funding by the State Foundation on Culture and the Arts, through legislative appropriations, and the National Endowment for the Arts. Again, registration ends tomorrow, so sign up online today. For more information, visit KoolauWritersWorkshop.com, or visit the event page on Facebook.